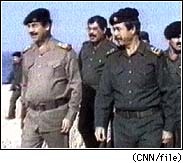 WASHINGTON (CNN) -- Iraq had the world's fourth-largest standing army until the United States brought the country to its knees in the Gulf War. But Iraq has been slowly rebuilding its military forces since 1991. And while it is nowhere near as powerful as it was, Iraq's armed forces still represent a threat to other countries and U.S. interests in the Persian Gulf region, military analysts say. "This is not the Iraqi military of 1990. The Iraqis suffered grievously during the Gulf War, and they have been very limited in their ability to rebuild," said Kenneth Pollack, a military analyst at Washington Institute for Near East Policy. "Right now in the Gulf, the United States has all of the military cards. Saddam has very few military options." Iraq's rearming effort has been hurt by post-war sanctions. In 1990, its 1.1 million-man military included 66 Army divisions and a variety of smaller units. Now the Iraqi military numbers 400,000 with 23 divisions, and only six are considered ready for battle. They are Republican Guard units loyal to Saddam Hussein. Pollack said Iraq has "a slightly improved version" of the SA-2 surface-to-air missile the Soviets used to shoot down the U-2 flown by American pilot Francis Gary Powers in 1960. Nonetheless, "If they took all of their forces, put them on the border -- Republican Guards, about 100,000 good troops -- they could cause quite a bit of damage," said Lawrence Korb, senior fellow at the Brookings Institution. Iraq's air force is even more rag-tag. It never got back 132 of its best fighters, which have been in Iran since the Gulf War. Pentagon sources say only 184 of its 305 remaining warplanes are working. Those are aging MiG-21s. Iraq is boxed in by more than 200 U.S. and allied fighter planes, including U.S. F-15s and F-16s in Saudi Arabia and Turkey, A-10 "tank killers" in Kuwait; and F-18s on the aircraft carrier U.S.S. Nimitz in the Gulf. Six of the 17 U.S. ships in the Gulf are equipped with deadly accurate Tomahawk cruise missiles; the type used to punish Saddam twice before -- last year and in 1993. The United States spends $500-600 million a year to maintain its military stranglehold on Iraq. The biggest U.S. worry about Saddam Hussein's military capability is not what he has, but what he may be hiding. There's no firm evidence that Iraq used chemical weapons in the Gulf War, but Saddam has used them before -- against the Kurds in the Iran-Iraq War during the '80s. And there is evidence of Iraqi plans to deliver nerve gas or germs by Scud missiles. The Pentagon believes the strategy against Iraq will likely keep U.S. forces in the Gulf for another 15 years, and will probably require periodic strikes to keep Saddam in line.